As I mentioned earlier, the bonus tiles were not yet useful and so it made sense to add that feature next. As you can see in the image, bonus tiles are now place-able and useable in word building as you would expect. What I didn’t expect during this process was that some restructuring of code made adding one of our new features the next obvious choice. WordPop now has an undo feature! We will let you undo your last move when you’ve done something to change the board (removed a word, rotated, or placed a bonus tile). 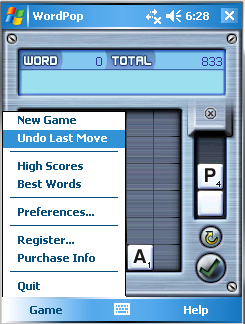 You cannot undo back more than one move, however. Let us know what you think about undo and how it should work. 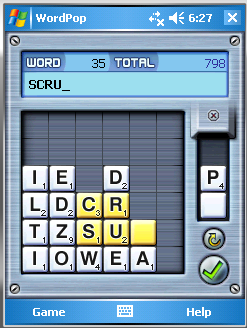 Next, the high score and best words dialogs! Wow, it’s been over three weeks since I last posted. I apologize for the dead air. Real life does have a tendency to get in the way from time to time (if you really care, you can read about it on my personal blog). Anyway, progress has been steady during that time. The gameboard is looking more realistic now as I am choosing letters according to our previously defined algorithm. This guarantees a reasonable balance of consonants and vowels (have you ever figured out which letter is guaranteed to appear on every board?). Furthermore, I’m validating correct words against our updated dictionaries. So, the short days of scoring “ZLDRRX” are over. Tiles fall into place when the round starts and after tiles pop and are removed. They will also fall when the board is rotated. 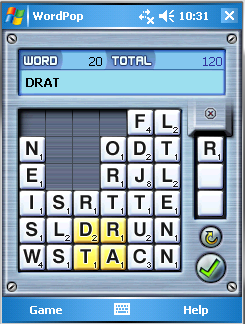 Bonus tiles are now falling according to your difficulty level when a round starts and after scoring a word that passes the bonus tile threshold. 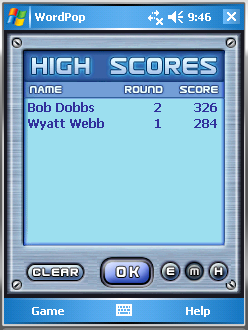 The word score and total score is now being updated. The word and word score text will only turn black when the word is valid. The word score will go bold when you’ve raised the score enough to earn a bonus tile. WordPop will play multiple rounds, now, too. As you expect, at the end of a round a new set of tiles is dropped in for the next round. Last, but not least, WordPop is persistent. That’s not to say that it bugs you forever or tickles your brain without mercy (which we already know it does), but it will save your game state when you quit. So, returning to the game later will restore your game state so you can continue on. Whew! That’s quite a bit, but there’s still some ways to go. Next on my list will be allowing the player to actually use the bonus tiles (details, details) and recording best words and high scores. 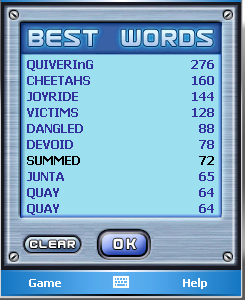 And, if you have best words and high scores, you should have a place to view them. So it makes sense that those dialogs will follow soon thereafter. The picture above is just to show a game in action with bonus tiles and the scoring going on. What you can’t see is that this is the image right after re-launching WordPop to show that I’m correctly persisting the game state. I hope to be back soon with more to share. Let me know what you think! Astraware’s Solitaire features 12 of the most well-known and best-loved single player card games. The games are Klondike, Pyramid, Spider, Clock, Yukon, Canfield, Four Seasons, Sultan’s Harem, Idiot’s Delight, Golf, Calculation, and Freecell, and to make the playing experience both familiar and fun, each game has custom gameplay options so everyone can enjoy the games using their favorite variation on the standard rules.